This campaign is the bee’s knees. Which is why Greenpeace Switzerland is sharing resources from its recent save the bees campaign for others to adopt, and raise awareness of the frightening fate of our food pollinators. Dan Schafler, Greenpeace Switzerland’s team leader for fundraising and innovations, says the successful campaign on the global declining state of bees started in its volunteer network where it was seeing notable results. 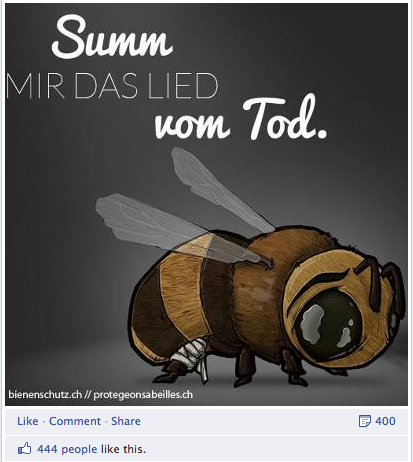 After Greenpeace Switzerland tested the campaign among small supporter groups and saw similar uptake, they built the bee issue into a national campaign. Since launching on three channels— e-mails, online advertising and social media — 45 per cent of visitors to the save the bee campaign site signed the petition calling for an immediate stop to using pesticides harmful to bees, greater chemical transparency and a national strategy for pesticide reduction. 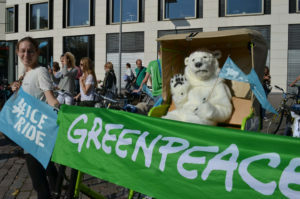 The mobilisation is high for Greenpeace Switzerland, with seven to nine per cent of petition signers also making a donation to support the campaign. To compare campaign results, in six weeks 26,000 of Switzerland’s 7.5 million population signed the save the bees petition. Collecting a similar amount of signatures for the Save the Arctic campaign took six months. 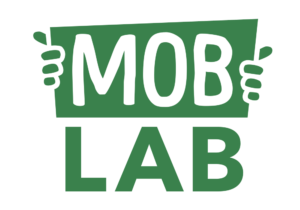 It’s for these reasons that Dan and Steff Kerkhof, Greenpeace Switzerland’s new media fundraiser and community manager, would like to see the campaign adopted at the international level. Because the campaign came from the volunteer network, volunteers supported and promoted the save the bees campaign in a major way, giving the campaign a boost in its early stages. The importance of bees and the agricultural ramifications if they disappear is an easy subject for the public to understand and support, adds Steff. Greenpeace Switzerland also partnered with the distributors of More than Honey, a successful Swiss documentary, to deepen awareness of declining bee populations among the public. Hosting cinema events for their supporters, they were able to invite 300- 500 people to view the film followed by a discussion. The film’s trailer was turned into a TV ad, airing on a private television network for free, reaching new supporters. The save the bees website features responsive design, allowing the campaign to attract mobile users from advertising, and 25 per cent of Greenpeace supporters to open and read the campaign’s e-mails via their phones. Steff adds that the Save the Bees campaign website is also compelling, with hand-drawn images. The site features simple, clear messaging that includes options for how people can make a difference: from signing the petition, to eating organic food, or downloading the petition form and collecting signatures. During the campaign, Greenpeace Switzerland says testing different web layouts and configurations was also essential, boosting fundraising outcomes. According to Steff, after outlining the disappearance of bees across the globe there wasn’t much else for the campaign to build on through storytelling. This is one area, storytelling throughout the campaign, that he thinks could be strengthened to keep people engaged on the issue. For people interested in running the campaign, Greenpeace Switzerland is offering its experience, as well as campaign resources including the website, bee illustrations, newsletter design and online banners with flash and backups. And what would they like to see happen as a result? “A successful international campaign to save the bees,” says Dan. Save the bees is now part of Greenpeace’s Sustainable Agriculture and Genetic Engineering (SAGE) campaign, with a European campaign launching soon.